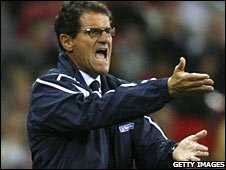 Coach Fabio Capello gave England's performance in the 2-2 draw with the Czech Republic a mixed review and defended his use of Steven Gerrard. The Italian was criticised for playing the midfielder on the left wing. Capello explained he was using Gerrard in a 4-3-2-1 system, with the Liverpool captain and Wayne Rooney supporting Jermain Defoe as a main striker. "The position he had to play was in the line of the full-backs and midfield," he said. "He never played on the left." Capello sought to get the best out of Liverpool's influential captain and Chelsea's Frank Lampard in the same line-up, a conundrum that has dogged his predecessors in the England job. On this occasion he opted to partner Lampard with Gareth Barry in the middle with David Beckham to the right of the trio. Capello added: "We played 4-3-2-1. We played Defoe, Gerrard and Rooney and three midfielders behind them. He [Gerrard] went to the left and to the middle." Gerrard was replaced by Joe Cole after an hour and the Chelsea midfielder admitted he was played out of position. "I'm a winger, but the manager wanted me to play off the front man," said the 26-year-old. "New manager, new ideas. We've got to try things." Only a last-minute goal from Cole saved England from defeat at Wembley, but Capello drew some positives from the salvaged draw, saying the performance was another step forward for his side ahead of World Cup qualifying campaign which begins in Andorra on 6 September. He was also concerned by the ease in which England were exposed by a fast counter-attacking Czech side and admitted it is something they will need to work on. "I think in the first half we played well, we had a lot of chances. "After the second goal from the Czechs, the direction was not so strong." "The problem is not with the style we played, but the difficulty we have when the other team play the counter-attack," added the 62-year-old. "It is always dangerous and we have to study this problem. "At this moment the players are not 100% physically, and important players like Rooney and Gerrard have played just one game. "I think this result is important. We played against a very strong team and we'll have more confidence for the next game." England's uncomfortable night was compounded by the announcement that the Football Association's chief executive Brian Barwick would leave his post by the end of the year. Barwick was instrumental in the appointment of Capello, but differences with chairman Lord Triesman have led to their relationship becoming unworkable. When asked about his departure the Italian said: "I am a friend of Brian, but it's not my job [to comment] - it's a board decision." Meanwhile, captain John Terry conceded that there had been "some plusses, but also some negatives" from their final warm-up game before the World Cup qualification campaign begins. "Maybe we should have won the game with the players we had out," the re-appointed skipper said. I suggest Capello shows the team a video of how GB are performing in China and shows what spirit, guts and desire to succeed brings! Of the crowd booing the players off, he said: "The crowd were frustrated as they'd paid a lot of money for their tickets, and we've got to put on a better show than that. "It's going to be a slow process, but hopefully we can get off to a good start against Andorra and go from there. "We've got players playing in the biggest competition in the world [the Champions League], but sometimes we don't click on the international stage. "But I don't think we should be worried. We have to stand up and be counted, raise our game, match teams with the commitment they show and hopefully our quality can overcome them."